Call Us 303-961-2047 and join the Phenix Family today! 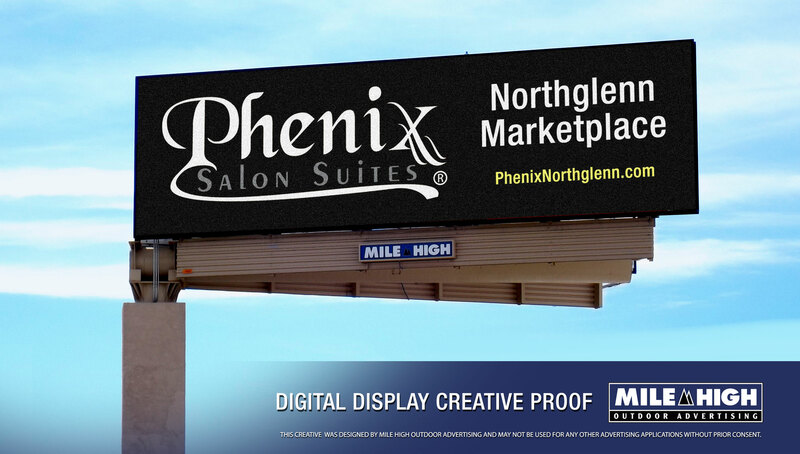 Phenix Salon Suites at Northglenn Marketplace (Hwy I-25 and 104th Ave.) Located in the thriving community of Northglenn, near Thornton, Westminster and Broomfield, the Northglenn Marketplace is now under new ownership and a vibrant redevelopment plan is underway. There is plenty of parking. A variety of retail, restaurant and service tenants make the Marketplace a great place to shop, eat, run errands and hang out! Phenix Salon Suites is a great compliment to the Marketplace and will become the areas one stop shop for a variety of salon, spa and beauty services! Please visit us! Stop in between the hours of 10:00 a.m. - 6:00 p.m. (Monday thru Saturday) to tour our beautiful state-of-the-art salon suites. We are looking forward to seeing you soon! NOW LEASING beautiful, spacious suites for all types of salon, spa, beauty, heath & wellness professionals!! Call 303-961-2047 or gdovicpokorny@phenixsalonsuites.com ATTENTION CLIENTS: Professional Salon & Spa Services NOW Available at Phenix Salon Suites Northglenn Marketplace! Connect with our professionals to view our Salon Directory at www.phenixnorthglenn.com *All suite businesses are independently owned & operated. Days/Hours of operation vary for each business. On-site managers available for assistance, Monday-Saturday, 10am-6pm. Before or after these times call 303-961-2047 for information or to schedule a tour. See you soon at Phenix Salon Suites Northglenn Marketplace!